Combine minced garlic and 1/2 tablespoon of olive oil together. Evenly brush the wraps with the garlic olive oil. Place wraps on baking sheet. You may need two baking sheets or have to do two wraps at a time depending on oven size. Broil for 2-3 minutes on each side or until slightly browned. Remove from oven. Add 1/2 tablespoon olive oil and onion; sauté 2 minutes or until translucent. 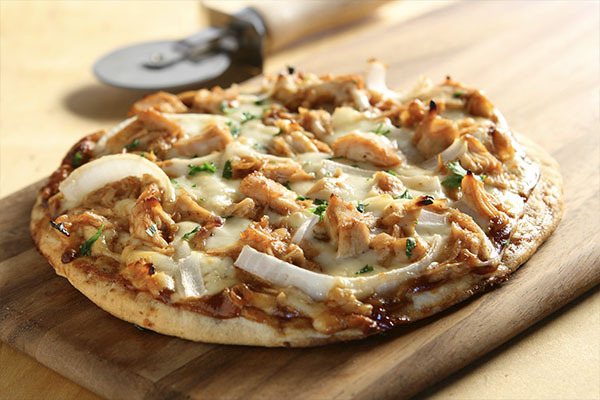 Stir in chicken, stock, pizza sauce, and BBQ sauce; cook for 5-7 minutes or until thoroughly heated. Evenly spread mixture over the wraps and top with mozzarella cheese. Broil for 3-5 minutes or until cheese is browned and bubbly. Top wraps with green onions and freshly cracked black pepper. Choose gluten-free wrap from Grocery Shopping Guide.